Cover each cookie in cream cheese. Open and unroll the red Fruit by the Foot™. Place 3 strips on the bar starting at the bottom and moving up. Open and unroll the blue Fruit by the Foot™, place about 3 strips in the top corner so that they’re less than half of the width of the flag. Use a pastry sleeve with a fine tip or clear plastic bag with the tip opened and fill it with white frosting. Draw a star on top of the blue strips in the corners. You can use white frosting instead of cream cheese. 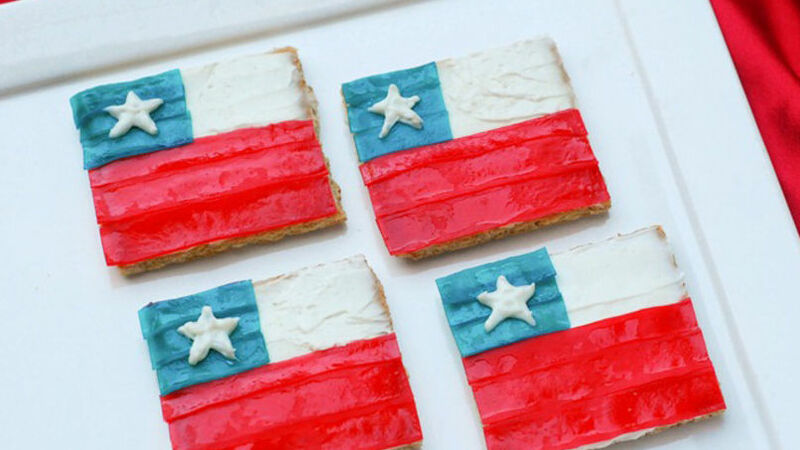 Chile’s independence is celebrated in September and it’s a great reason to party! How about using these flags to decorate the table of sweets? Though it’s hard to eat something so pretty, these are just enough for one person.